The Philippines is one of the strongest contenders in the business processing outsourcing industry. Backed with proud years of bagging the title “Outsourcing Hub of Asia”, the country remains immovable towards immense changes. Meanwhile, the country’s strong Asian contenders are India and China. For a while, India holds the glory as the world’s most performing BPO country as it brags the cheapest fees of all. However, it didn’t last for long as the Philippines continuously proved its competence in the global market. Slowly but steadily, the country gains its momentum once again and soared high. However, success is never gained overnight. Surely, there are factors which affected each and every decision that has ever made. Here’s how the Philippines became the top BPO destination among foreign investors. As the outsourcing industry continues to create a big impact on the Philippine economy, more and more Filipinos display their competencies. They wanted to prove that intelligence alone should not be the only deciding factor for employment, most especially when the Philippines is known as the outsourcing hub of Asia. Now, employers are looking for special characteristics that most probably won’t be taught. Some of these are their dedication and hard work. Most Filipinos believe that hard work will surely pay off once they give it their best shot. They have a certain dedicated mentality that values their job as much as their social affiliations. These characteristics were embedded in the country’s culture ever since and are the same traits that employers prefer for their future employees. 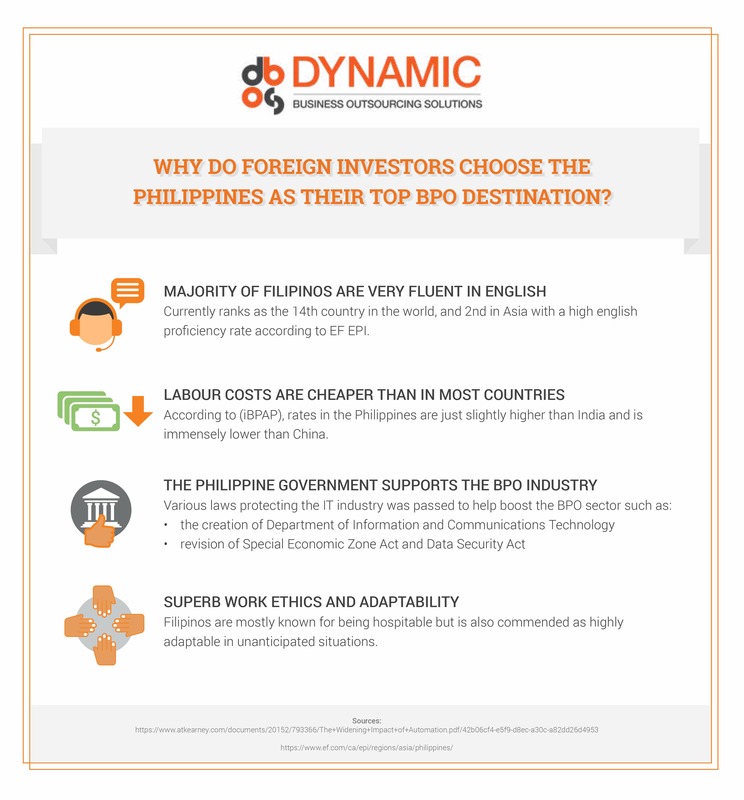 There are more conclusive explanations as to why the Philippines has been dubbed as an ideal BPO country for foreign investors. Listed above are only a few of them. However, this doesn’t change the fact that the Philippines is indeed enough to be called the “Outsourcing Hub of Asia”. Be more convinced when you read this.